New Machine Build Pilot arc for Cnc plasma? Thread: Pilot arc for Cnc plasma? Pilot arc for Cnc plasma? Hi all iv just finished build my Cnc plasma gantry and made a mistake and bought a hf start machine .... I’m currently experiencing extreme emi issues. My question is will a pilot arc machine be a better choice regarding hf noise to my electronics and pc? ... a recent google search reveals that pilot arc reduces noise is ,how true is this? New Product- The PILOT PRO CNC V3 Router / Laser / Extruder / Water jet / Plasma / Etc. ALL NEW! Can I convert HF plasma to arc pilot plasma?? Re: Pilot arc for Cnc plasma? Pilot arc can still use HF starting. The most common alternative to HF start is blow-back start, and it always includes pilot arc. From what I've heard, blow-back start is much better as far as interference. Plasma voltages are quite a bit higher than tig voltages. Also, if you were going to use an arc starter, it would be much easier to use a traditional HF start torch I would think. That statement in the original post is not correct. Pilot arc is ANY plasma that has the means to strike an arc without physical touch, so that include HV AND HV/HF start plasmas. Scratch start and blow back do not have a pilot arc so they have to make physical contact with the material. That makes them not suitable for use on CNC machines. As for interference, that HV/HF type does create much more interference, but they can and are used on cnc machines, and so are the HV start ones. You need to have the proper grounding and shielding, otherwise nothing will help you. A metal case for the electronics is a must, separating the cnc machine from the cutting table is also good to avoid interference if you do not have proper grounding. I think you are confusing what pilot arc means. 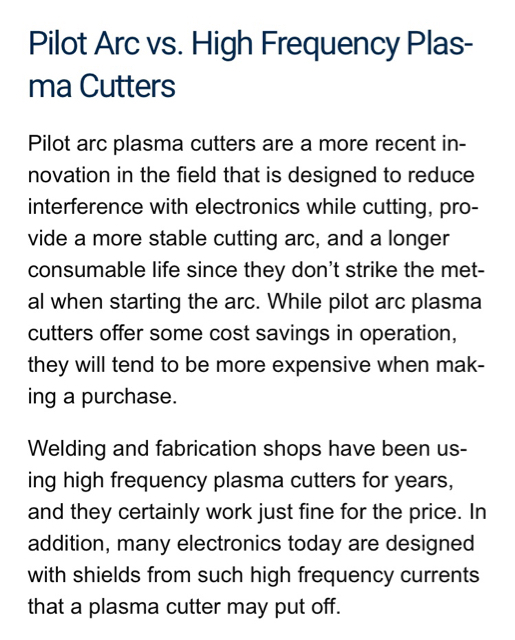 Pilot arc will create an arc without even having proximity to the workpiece. Because of this, it can be used on painted or rusted metal that has a non-conductive surface. The pilot arc is hot enough to burn through the paint or corrosion and then establish a direct plasma arc with the conductive workpiece underneath. All blowback start plasma cutters I've seen are pilot arc. Also, I've never heard of scratch start plasma (doesn't mean it doesn't exist,) that's usually a term that refers to TIG. You should really do some more reading before you accuse someone of confusing things. In regards to number 2 ,If what I’m saying is correct this means if I use a power source to power my electronics that is completely isolated from the power lines of the plasma machine for eg. use the neighbors power lines or a generator or a UPS then I shouldn’t have any physical contact with EMI/RFI? None of that is new info to me. What do you think I got wrong? I just want to know if a use a isolated power source for my electronics, will I be able to ditch the hf via the power lines?